And Here We Go! 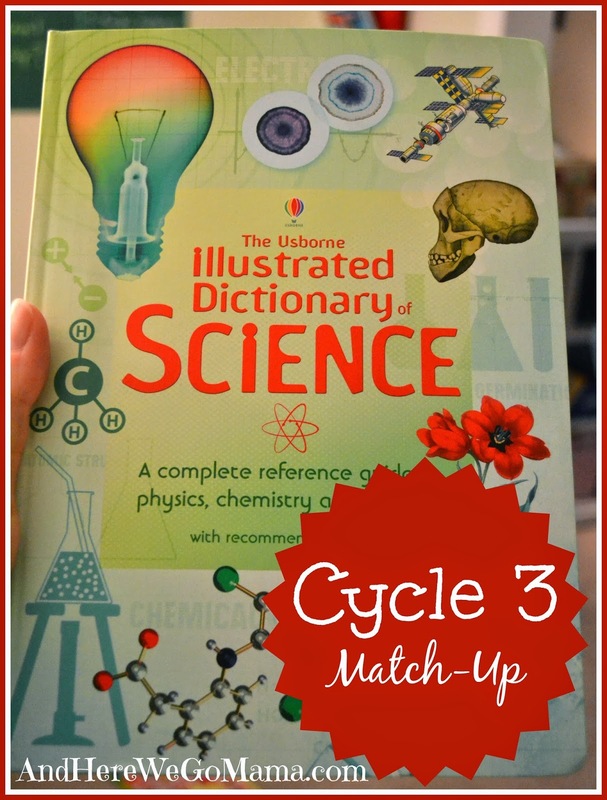 : Final Version - Usborne and Cycle 3 Science Match-Up! Final Version - Usborne and Cycle 3 Science Match-Up! 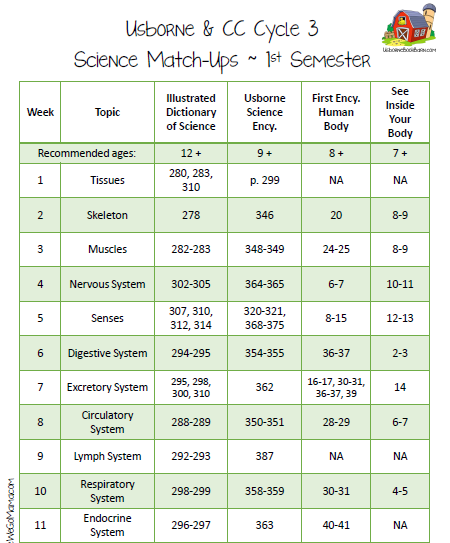 I created an Usborne and Classical Conversations Science Match-Up earlier, and now the full year version is complete! In this final version, I included the Illustrated Dictionary of Science, which is perfect for older Essentials students. 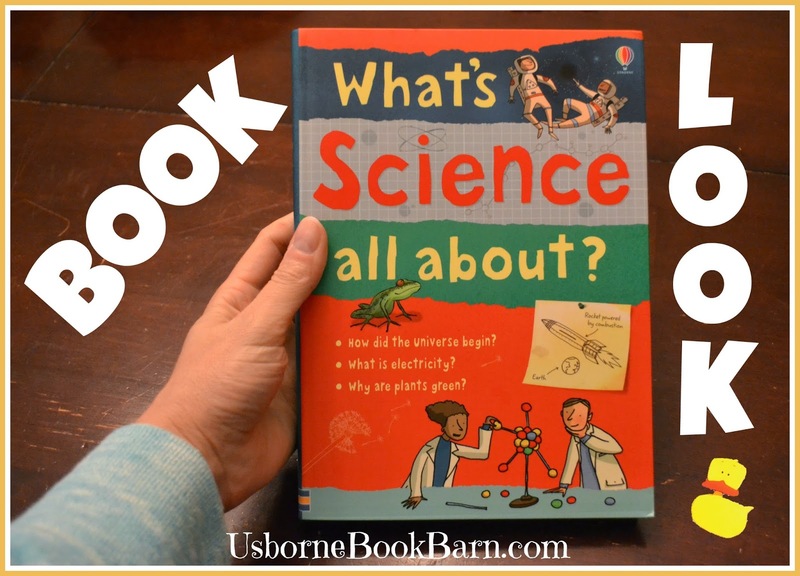 This book, along with the Usborne Science Encyclopedia, can be used for all three cycles of Classical Conversations! It's a combined volume, which means it has three books in one (cheaper price that way!). One of the special features of Usborne books is the bite-size chunks of knowledge. A child can open up this book to any page, start anywhere on that page, and learn something! With the many headings and large text-to-picture ratio, there's always a definite beginning and ending to information. One doesn't feel overwhelmed by the text. Love it! Isn't it great! I'm glad I have the younger books, like See Inside Your Body, but I'm also glad to have this more mature reference book for my girls to grow into! One man said that having this book at home growing up helped influence his decision to become a doctor. Nice! Speaking of See Inside Your Body, it's now out-of-print. Bummer! However, I've talked with my team leader who has 10 years experience working for Usborne, and she said that they're probably putting a new cover on it, and it might pop back up in the catalog that's about to come out in July. It's an award-winning book, so I'd be surprised if it didn't show up again in the new catalog. But, if you're looking for a great replacement for that book, Look Inside Your Body is also fantastic! Check it out! I hope the match-up will be helpful! I'm excited about using it with Cycle 3 in the Fall! Hi! We love Usborne books as well. I was wondering if you have access to both of these....how does the Illustrated Dictionary of Science compare with the "What's Science All About" book that also has sections on physics, chem and bio (and can also be bought as separate books)? Thanks! Ooh! Great question, Lisa! I have both books, so I'll take some pictures of the other book tomorrow and post them to usbornebookbarn.com. Check over there tomorrow night or Saturday morning! Awesome Melody! Thanks so much!! I have raved to everyone in Birmingham about how wonderful my Foundations Tutor Trainer was :) Thanks for all your creative ideas! !